I'm as guilty as any other beauty addict having fallen in love with luxury beauty products and whilst they can transform your skincare routine, they're not all cost-effective. But battling pesky breakouts and tackling combination skin, doesn't have to leave you broke. And Good Things Pore-fectly Clear Face Wash has proven just that, having become my go-to cleanser since having packed it in my case on my recent holiday and costs just £4.99. 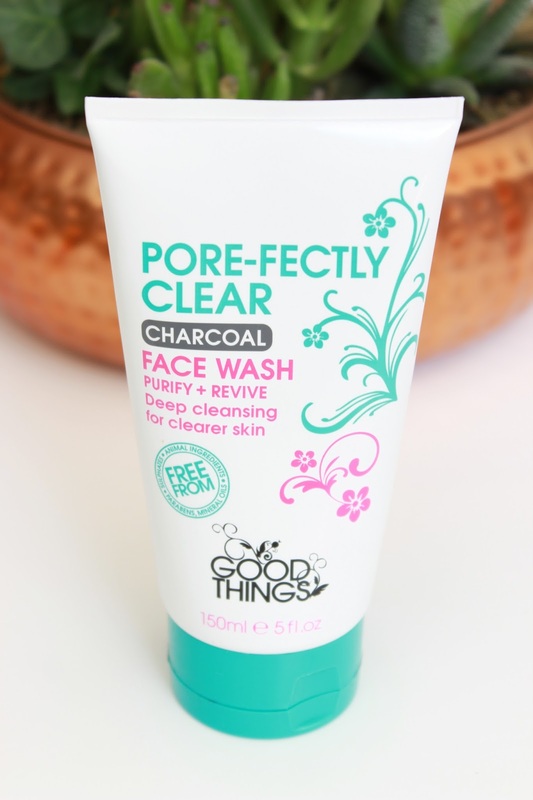 This natural purifying and reviving face wash from Good Things combines pomegranate extract, willow bark to help smooth skin, charcoal powder to draw out impurities and absorb excess oil and caffeine to help reduce skin redness and tighten pores. And I think it's important to note that Pore-fectly Clear is free from the ingredients we all wish (or should wish) to avoid including: Parabens, Mineral Oils, Sodium Laureth Sulphate and animal ingredients. The gel face wash (ideal for combination to oily skin types) is dark in colour due to it's formulation of charcoal powder and whilst those of you with sensitive skin may squirm as many drugstore facial washes can be stripping, Good Things Pore-fectly Clear doesn't aggravate dry patches and never irritates. In fact once massaged into damp skin and rinsed with warm water, it washes away dirt and oil gently, leaving my skin looking smooth, fresh, clearer and more even in tone. And the fact I've been reaching for it over the likes of my Elemis face wash is testament to how good it truly is. Designed for young skin and developed by award-winning beauty writer Alice Hart-Davis I wouldn't hesitate to repurchase. And this isn't the first time Good Things has made an appearance on BBA and I can't imagine it will be the last. So before spending big bucks on on a fancy face wash, I urge you to try Good Things Pore-fectly Clear Face Wash available at Boots for £4.99 - not only does it work, it's guilt free! Have you tried any products from Good Things?